…is not always a pretty place. However, it can be good practice. Over the last week or so, I’ve been working with a friend to build a blog dedicated to haiku and senryu (more to come on that when we officially announce it). 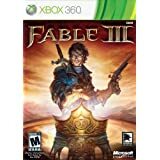 After a week of pondering such forms to get content ready for the site, I happened to purchase the new Fable III video game. My first instinct was to play it non-stop, but my close-second instinct was to combine it with my other current obsession. So now, I’ll be sporadically writing haiku and senryu to narrate/illustrate Fable III’s main storyline. Spoilers will be involved!